The Sea Tel 3011 is the latest 3-Axis marine stabilized antenna system from Sea Tel built for smaller vessels who want the same performance and capability that would expect on a much larger antenna. 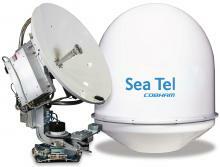 The Sea Tel 3011 design incorporates the latest frequency-tuned radome design and electronics used in the industry-leading XX09 series systems. The antenna is a 75cm (30in) Ku-band marine stabilized antenna system for broadband connectivity. Incorporated in the design are some of the leading technology concepts to reduce its size and match the performance of some of our bigger 1m systems. Model 3011 is built on the industry-leading stabilization platform with stabilization accuracy of 0.2° (RMS). It withstands the harshest weather nature can throw at it. The Sea Tel 3011 antenna system comes as standard with co pol and cross Pol feeds and dual Quad Band LNBs, allowing customers access to global Ku coverage, wherever they might be. The antenna is not designed for compromise. It is packed with high performance features that acquire the satellite and maintain tracking with industry-leading Sea Tel tracking algorithms. The fast response rate to the ship’s motion, the next generation electronics and the four axes of pointing and three axes of stabilization easily makes Model 3011 the industry’s most capable antenna system in its class today.